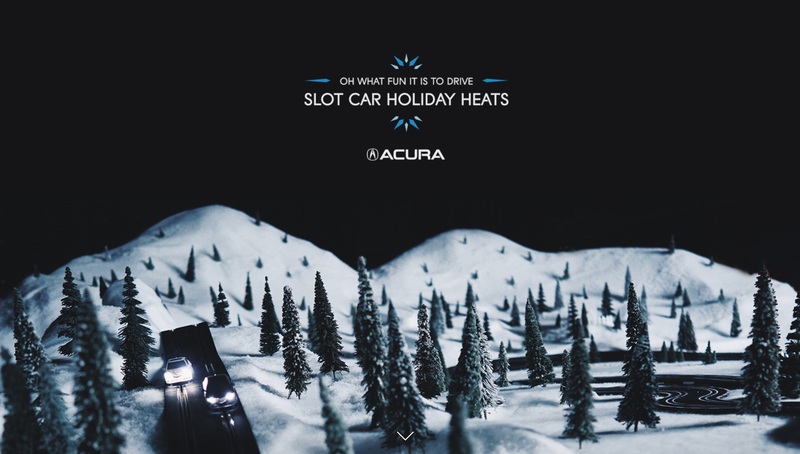 Acura asked us to activate their “Oh What Fun it is to Drive” Winter Sales Event by connecting with a hard to engage, advertising averse, yet socially connected audience. We did this by reinventing a holiday tradition. Classic slot car races provided a powerful insight and mechanism: rekindle the love and excitement of getting an iconic toy, and translate that nostalgia into the joy of considering a new car. This led us to create the first ever Periscope race: a live slot car race event with a multi-camera broadcast, one factory race car driver and a sports network commentator, inviting users to #RaceYourHeartOut. We customised and connected two 3D printed Acura TLX slot cars and each was given their own Periscope account. Users selected and followed on Periscope the TLX they wanted to race, they then joined the car’s broadcast and simply “hearted” the screen to make it go faster. The more the viewers on each team would “heart,” the faster their slot car would go. How did it work exactly? Well, every heart press was monitored real-time on both Periscope accounts. Arduino then converted the heart into a unit of current and accelerated the corresponding slot car. The entire race was captured live via five cameras along the track and edited (live in real time) into a Periscope broadcast along with running commentary from Acura factory race car driver, Ryan Eversley and sports broadcaster, Greg Mescall.